Nearly 2 years ago, my husband and I committed to losing weight together. I even reached my goal weight and he no longer needs blood pressure medicine. It took a lot of dedication and was very rewarding, but we eventually fell back into old habits when life got busy and stressful. Those old habits caused me to gain weight, stole my energy, and while they were easy caused me to just feel yucky. If you’re like me and have let the busyness or stress of life get in the way of your family’s health, here are some tips to help you re-focus on the health of your family. Rather you choose a specific diet plan for your family or choose healthier alternatives than your current diet, the key to your success will be in meal planning. The best way to avoid getting fast food or reaching for junk food is being prepared with a better choice. I can’t emphasize enough how important it is to be intentional about meal planning. It really makes it easier to stick to your goals and although it takes some planning and effort it will help your days run smoother. Make 2 of something and put the other one in the freezer to have on a hand when you don’t have time to cook. Prepare what you can in advance. I always cook ground beef and turkey before putting it in the freezer. It speeds up cooking time quite a bit when I need an easier dinner. If your family enjoys smoothies, make ready to blend fruit bags for the freezer. Then you’re not left washing and preparing everything for them each morning. Keep foods you are trying to avoid out of the house and replace them with healthier snacks that you have already prepared. Dividing serving sizes into baggies or containers is really helpful too. If you’re not going to be home for a while be sure to bring some snacks with you, to help you resist getting fast food. Looking at your calendar when you’re making your meal plan is beneficial too. I usually choose a slow cooker meal or something that I can prepare earlier in the day when we have busy afternoons or evenings. If you have an Instant Pot, this would also be a great go-to for those busy nights. Exercise doesn’t have to be strenuous. Walking quick enough to get your heart rate up for about 30 minutes a day is beneficial. Walking is my go-to form of exercise. Maybe you like running, dancing, or weightlifting. The important thing is to find a form of exercise you enjoy because it will be easier for you to commit to and follow through on doing it. To encourage your family to be active, try incorporating weekly challenges. Each week decide on a challenge for your family to complete. If your family enjoys some friendly competition, everyone can compete against each other. You might want to make the competition more of a family goal, with each of you reaching to beat your own personal bests. It’s totally up to you. Our family will switch it up week to week, depending on what the challenge is. The best thing about doing weekly challenges with your family is you’re making memories together and getting healthier at the same time. See who walks the most steps in a week’s time. Who exercises for the most minutes for the week. Maybe, who can do the most push-ups during the week? Instead of having a challenge that lasts all week, it’s also fun to have a physical challenge for your family to complete together on a certain day. You could go on a hike. Make and race through an obstacle course for the best times. Play at the park together. Your children would have a blast playing “The Floor is Lava” with their parents. Do you see how your family could easily be making memories and having fun while getting healthier together? Working towards a common goal also strengthens relationships, as your family encourages one another. Our family has made a commitment to re-focus on our overall health this year, we call it the Family Health Challenge. You can read more about it here. 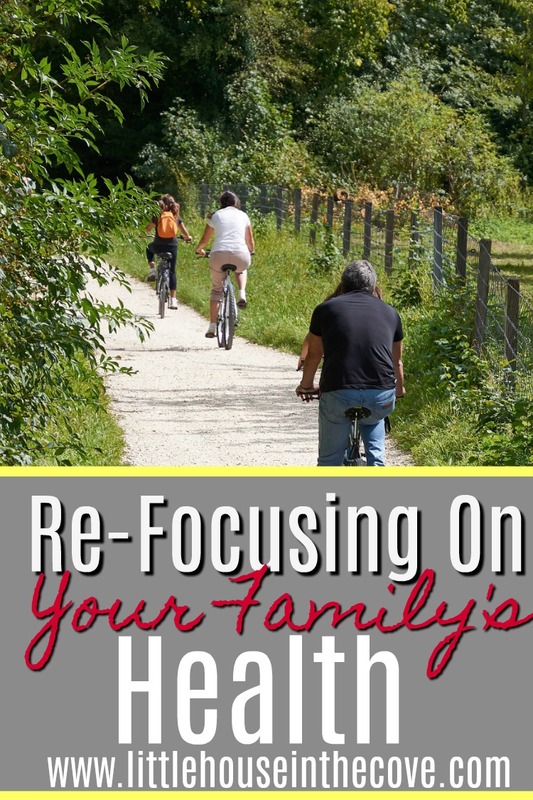 Are you ready to re-focus on your family’s health? Start your own Family Health Challenge! We’ll be documenting our journey for the entire year of 2019 on our YouTube channel, including the challenge for the week. You could choose to follow along and do the same challenges or just check in for encouragement. Misty is offering this limited time Health Challenge printable to you to help get you and your family on the right track! **Signing up for this freebie will add you to the Little House in the Cove mailing list and Many Seasons of Motherhood. I hope you’ve been inspired to re-focus on your family’s health. If you have any meal planning tips or ideas for challenges, I would love to hear them! Misty is a child of God, wife, and mom of five, in the midst of many seasons of motherhood. Her heart is to encourage other moms to find joy in each season of motherhood and make precious memories in the process. She shares about motherhood, homeschooling, and foster/adoption at manyseasonsofmotherhood.com. You can connect with Misty on Facebook, Instagram, and YouTube.